Monroe County was established in 1816. The county went through several border changes as the other surrounding counties were also formed. Its present borders were established in 1827. Monroe County covers 398 square miles. The county seat is located in the City of Waterloo. Monroe County is located on the east side of the Mississippi River. Monroe County is bordered by St. Clair County to the north and on the east with the Kaskaskia River forming the border and Randolph County in the south. The Mississippi River is its western border. There are 6 major cities or villages in the the county. Those communities range in size and population. The largest community in Monroe County is Columbia Illinois. For information on the communities that are found in Monroe County, see our Monroe County Illinois Communities page. Important roads and highways for the county are Interstate 255, US Highway 50, State Highways 3, 156, 158, 159 and Bluff Road, Levee Road, LL Road and other. What Attractions are in Monroe County? There are some unique attractions that are located in Monroe County. Historic Maeystown Illinois makes a wonderful day-trip any time of year with several annual events held throughout the year. The entire village is on the National Register of Historic Places. The Peterstown House, also on the National Register, is located in Waterloo Illinois and was built in the early 1800's. It is the only stage coach stop still intact along the Kaskaskia-Cahokia Trail. Bluff Road runs along the Mississippi River bluffs through the American Bottoms and features wonderful changing scenery through out the seasons. The Schorr Lake Vineyard and Winery is found in Waterloo and offers estate produced wines and a patio for relaxing. Many recreation opportunities are also found in the county. Golf courses and parks are found throughout Monroe County. 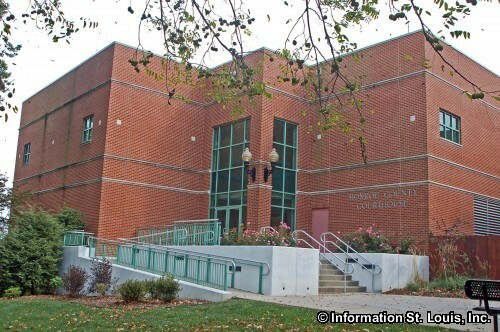 Below is a list of the some of the attractions, parks, schools and communities located in Monroe County Illinois.